Detroit, MI-- Wasserman Projects, an independent, interdisciplinary arts space, will open its doors on September 25th, during Detroit Design Festival. Located in the historic Eastern Market, the new space will launch with two exhibitions featuring large-scale interactive installations by Markus Linnenbrink / Nick Gelpi and Jon Brumit. Opening reception: Friday, September 25, 6-10 pm. Among the various disciplines represented is a shared exploration of form and function, as well as the opportunity for engagement through interaction and participation," describes director Alison Wong. "What I find most exciting is the collaborative spirit of the exhibition and the ability for the work to inspire new creative relationships." Inside the main 5,000 square-foot space, Wasserman Projects will present a site-specific	installation titled THEFIRSTONEISCRAZYTHESECONDONEISNUTS by German born, Brooklyn-based artist Markus Linnenbrink created in collaboration with Miami Beach architect Nick Gelpi. The exhibition combines art and architecture, integrating architect’s form-making process with the artist’s painting techniques, to create an elaborately designed environment. This synthesis in the pavilion serves to blur boundaries and find possibilities for new experiences between art and architecture. Visitors are invited to walk around the pavilion, peer inside through small punctures, and linger inside the object itself. Using the framework of simple architectural forms, Gelpi's design incorporates modular variations and dynamic shifts in dialogue with Linnenbrink's painting. The structure's interior reveals vibrantly hued parallel strips that run across the walls, ceilings, and floors transforming it into a 3-dimensional walk-all-over work of art. The pavilion is designed to open up along a central split, and be used as a platform for special events including a musical performance by Detroit DJ Jeedo X with guest saxophonist, Saxappeal during the opening reception. 2014 Kresge Fellow, Jeedo helped pioneer a unique sound inspired by Detroit's rich musical history from Motown to it's underground hip-hop and techno scene. In addition, a selection of works by Linnenbrink, Gelpi, and Brumit will be on view in the gallery. Simultaneously, Wasserman Projects will open an outdoor installation by Detroit-based artist Jon Brumit, Elf Waves, Earth Loops, and *Spatial Forces. Drawing inspiration from disparate sources, such as public engagement, harsh noise, GMOs, pirate radio, and vibrational healing, the installation will present three distinct but intertwined projects: a sonorous grain silo, lathe-cut loop records, and public radio broadcasts. Elf Waves (Sound House 2) is an engaging public sound project housed in a modified grain silo that offers an aural, visual, and physical experience. The silo responds to visitors by playing a composed soundtrack through the floor and ceiling of the repurposed structure upon their arrival. Earth Loops, an installation of GMO-inspired synthesizers and original lathe-cut records, gives visitors the opportunity to play live music along with the	records infinitely playing extracts from New Earth, the album composed specifically for the *Spatial Forces radio project. ￼	*Spatial Forces (Shed 13) is a public radio-based sound sculpture in 13 parts, broadcasting throughout Eastern Market on 100.1 FM. Comprised of a cluster of 13 short-range FM radio transmitters installed on Russell Street from Mack to Gratiot Avenues, it is a drive-thru audio collage, heard only with an FM radio, of broadcasts of each of the 13 tracks from New Earth simultaneously. This is the premiere of Brumit's citywide radio project WTBD (Terrestrial Broadcast Detroit), a Knight Arts Challenge awarded project. 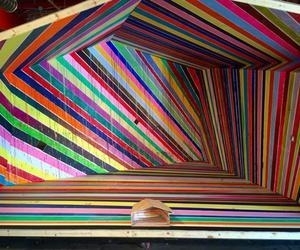 Markus Linnenbrink is a German-born artist living and working in Brooklyn, New York. His work is included in the permanent collections of The Hague Ministry of Culture, the Netherlands; Harvard Business School, Cambridge, MA; the Hood Museum of Art, Dartmouth College, Hanover, NH; Museum Neue Galerie, Kassel, Germany; the San Francisco Museum of Modern Art, San Francisco, CA; the San Jose Museum of Art, San Jose, CA; UCLA’s Hammer Museum, Los Angeles, CA; Wellesley College, Wellesley, MA and the West Collection, Philadelphia, PA, among others. Nick Gelpi is the Design Principal and Founder of GELPI Projects, a Miami-based interdisciplinary design firm dedicated to examining the relationships between material exchange and cultural production as it relates to the built environment. Gelpi’s design practice has won numerous design awards including first place for the proposal “Table Distortions” at the Wolfsonian Museum in Miami Beach, a Pamphlet Architecture Honorable Mention for the proposal “System Failure,” and, most recently, the first place in the international design competition for a new Wynwood Gateway Park in Miami, “The Wynwood Greenhouse.” Gelpi has exhibited furniture and installation work in museums and galleries internationally. Jon Brumit is an artist working with sound, structured improvisation, and public engagement. He has participated in solo and collaborative exhibitions at the Whitney Museum of American Art (New York), Novi Sad Contemporary Museum (Serbia), Radio Web MACBA (Barcelona), Museum of Contemporary Art (Los Angeles), 0047 (Berlin), and In-F (Tokyo). Wasserman Projects is a flexible and constantly evolving program of art, design, and music, that brings together artists of all disciplines. Our mission is to promote the work of outstanding practitioners based locally and around the globe by hosting exhibitions, conversations, and supporting creativity wherever we can be useful. Through collaborations and programming that generates interest, curiosity, and commerce, our goal is to become one of the many threads in the vibrant fabric that is Detroit.